When taking samples for reading you should use either a plastic alcohol resistance test jar or a glass test jar. Regular plastic hydrometer test jars will give inaccurate readings and the alcohol may dissolve the plastic. 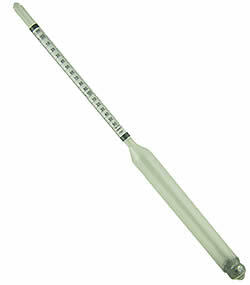 This hydrometer is for distilled alcohol only. It cannot be used to test wine, beer or any other fermented beverage.